In 1937 H.P. Lovecraft died penniless and broken -- both in body and spirit. Plagued with nightmares, dreams, and visions, this master of horror led a life riddled with psychological pain as he battled a family history of dementia and instability. His fame mostly posthumous, Lovecraft considered himself a failure. No hardcover collection of his works was published in his lifetime. Little did he know that sixty years after his death he would influence a new generation of writers such as Stephen King and Anne Rice, and be regarded by many as the godfather of the modern horror genre. Now, at last, the most important tales of this distinctive American genius are gathered in one volume. 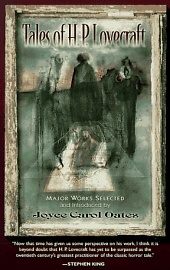 Joyce Carol Oates, herself a writer of gothic tales, has selected the best works by this overlooked writer and, in a penetrating introduction, explains how Lovecraft initiated "the fusion of the gothic tale and what would come to be defined as science fiction." Combining the nineteenth-century gothic sensibility of Edgar Allan Poe with a daring internal vision, Lovecraft's tales foretold the psychically troubled century to come. The beleaguered artist maintained an almost obsessive preoccupation with the dementia that resides just beneath the surface of the ordinary world. Set in a meticulously described, historically grounded New England landscape, Lovecraft's harrowing stories explore the collapse of sanity beneath the weight of chaotic events. Working in a prose both luminous and grotesque, Lovecraft creates a frightening shadow-world where the supernatural and the mundane meet, reality and nightmare intertwine, and redemption can only come from below. Finally, after decades of neglect, Lovecraft's stylized tales of the depraved and the the fantastic are enjoying the recognition they deserve.